From the Baldwin County Courthouse, go west on Hancock Street for 2 blocks or 0.2 mile (or the one large block containing Georgia College & State Univ.). Turn right on Clarke Street. Go one large block or 0.2 mile. Turn left onto Highway 22 west (Montgomery St.). Go 5.0 miles. Turn right on Old Monticello Rd. Go 3.9 miles. The church and cemetery are on your left. Graves 1-16 are to the left of the creekbed. Graves 17+ are beyond the creekbed. 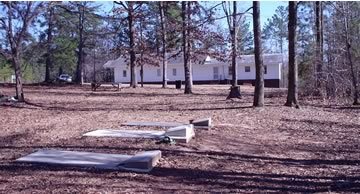 The cemetery may have as many as 75 unmarked graves. Named spelled Cannor on gravestone; correct spelling probably Cannon. Death date difficult to read. Appears as 1899 but is probably 1999. Day of death may have another number after the '2'. Grave within fence and marked with a stone. Handwritten on slab. Last name spelled 'Haddox', but correct spelling is probably 'Haddock'. Death date difficult to read. At least 38 and as many as 75 graves.